It was both the most memorable moment from John McCain’s 2008 presidential campaign and a glimpse into the future of the Republican Party and America’s angry and divisive modern-day politics. Played and replayed constantly since the senator's death on Saturday at age 81, the moment seems to presage the rise of the "birther movement," the era of "alternative facts," and the presidency of Donald Trump less than a decade later. At a high school about 30 miles south of Minneapolis, a blond woman in a red shirt addresses McCain, who is in the final weeks of what will be his second failed run for the White House. "I gotta ask you a question," she says. "I do not believe in, I can't trust Obama. I have read about him, and he's not a . . . he's an Arab." 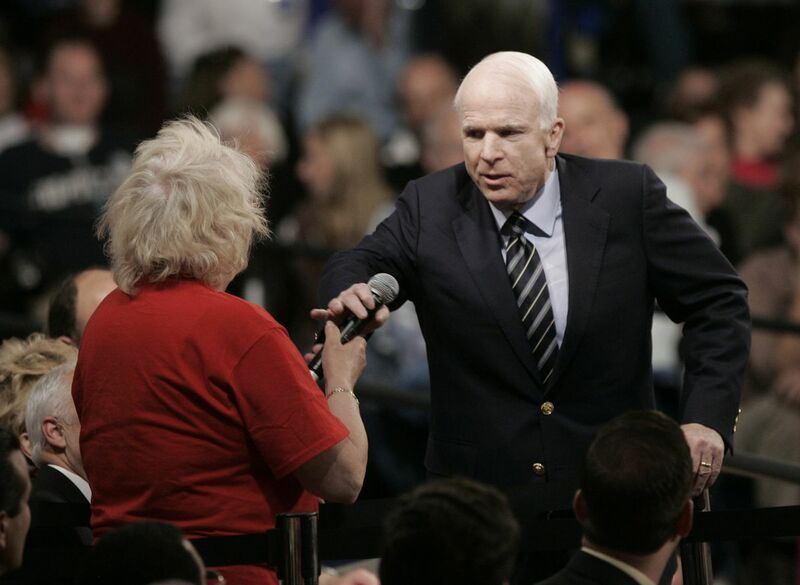 "No, ma'am," McCain replies, shaking his head and taking the microphone from her. "He's a decent family man and citizen that I just happen to have disagreements with on fundamental issues, and that's what this campaign is all about." In the final weeks of his campaign, McCain would try to make his campaign more about the issues, upsetting a party base that accused him of not hitting harder at Barack Obama's background or questioning his patriotism. As the campaign ended, it would become dominated by their anger, at times egged on by the pre-Trumpian populist whom McCain had chosen as his running mate, then-Alaska Gov. Sarah Palin, R.
The party's next nominee, 2012's Mitt Romney, would run afoul of the same dynamic. But in 2016 Republicans would find in Trump a nominee who spoke to, indeed encouraged, the fears of the woman in red. The division that spawned the moment was not McCain's chosen route to the presidency. Shortly after he had secured his party's nomination, the senator proposed a barnstorming series of nine debates with his Democratic opponent around the country. He suggested to aides, perhaps naively, that he and Obama fly together to the first one. Ever the foreign policy wonk, McCain wanted a "campaign about policy," said Richard Fontaine, a senior adviser to the senator. He knew by October 2008, when he appeared in Minnesota with Palin, that his campaign was becoming something else entirely. "That was a pivotal moment," recalled David Axelrod, senior strategist for the Obama campaign. "When Senator McCain chose Palin there was a bit of a Faustian bargain. She spoke to the emerging base of the Republican Party in a much rawer way and drew out some of the rawer forces that had been subsumed." Axelrod recalled sitting in a hotel room and watching McCain take the microphone from the woman at the rally. "John McCain was saying this is not what I'm about. It's not what I want the Republican Party or my country to be about," Axelrod said. "He was not just grabbing the mic. He was grabbing control back of his campaign. It was a brave thing to do." McCain's actions that day shaped the way both he and his presidential campaign are remembered, but they did little to contain the forces of anger and ethno-nationalism that had been unleashed by the 2008 economic crisis, the rise of social media and, to a certain extent, his own campaign for the presidency. "He did the right thing and deserves credit," said Dan Schnur, a communications adviser on McCain's 2000 presidential campaign. "But it was fairly clear in that moment that it wasn't going to be enough. It was a principled, noble stand, but not enough." Barely a month had passed since McCain announced Palin as his running mate at a rally in Dayton, Ohio. "She's not from these parts, and she's not from Washington, but when you get to know her, you're going to be as impressed as I am," McCain said at the time. McCain had thought he was getting a like-minded reformer. Instead he got "a culture warrior," adept in a new kind of Republican identity politics, Schnur said. Just three days before McCain's moment in Minnesota, his campaign released an ad attacking Obama for his ties to William Ayers, a founder of a radical anti-Vietnam War group that had ceased to exist when Obama was still in grade school. "Barack Obama and domestic terrorist Bill Ayers . . . friends," the ad began. "But Obama tries to hide it. Why?" The advertisement, combined with the increasing likelihood of an Obama victory, had unleashed the torrent of Republican anger that Palin helped stoke. At a rally in Florida she had whipped up supporters by telling them that Obama liked to "pal around" with "urban terrorists," prompting a person in the crowd to shout "Kill him!" The day before the Minnesota rally, McCain and Palin appeared together in Waukesha, Wisconsin. The senator seemed shocked by supporters who shouted "Terrorist!" and "Off with his head!" at the mere mention of Obama's name in association with Ayers. McCain was also visibly uncomfortable with the Ayers line of attack that was being perpetuated on television and at rallies in his name. "I don't care about old washed-up terrorists," he said at the rally, and instead suggested that the real question was whether Obama had lied about the extent of his relationship with Ayers. His discomfort was even more apparent the next day in Minnesota. "We would like you to remain a true American hero, [but] we want you to fight," one supporter railed. "I will fight but we will be respectful. I admire Senator Obama," McCain said to a chorus of boos from the crowd. Another man, who said his wife was pregnant, told McCain that they were "scared, scared of an Obama presidency. We don't want to bring up our child in a country. . . . [run by] someone who cohorts with domestic terrorists like William Ayers." McCain called his opponent "a decent person and a person you don't have to be scared of as president of the United States." Finally came the comment from Gayle Quinnell, 75, of Shakopee, Minnesota, wearing the red shirt, who called Obama an Arab. After the rally, a CNN reporter tried to explain to Quinnell that Obama's father was a Muslim but that the candidate had always been a Christian. "Yeah, but he's still got Muslim in him," she said. Quinnell was parodied on "Saturday Night Live" a few days later in a skit that featured a crazed McCain-Palin supporter wandering through the "Weekend Update" set and proclaiming that Obama was "50 percent Egyptian. He's gonna changed the White House into a pyramid." Quinnell said later that she found it funny. Quinnell's daughter told reporters that her mother did not have access to the Internet and had read that Obama was a Muslim during a visit to the library. At the time, Quinnell worked supervising children with mental disabilities during school bus rides. When McCain responded to Quinnell, polls showed that about 12 percent of Americans thought that Obama was a Muslim. By late 2015, as Trump campaigned for the presidency, the number had surged to about 30 percent of the population, according to a CNN/ORC poll. A stunning 45 percent of Republicans and 54 percent of Trump supporters said Obama was a Muslim. In the years that followed, Palin would become a Fox News and reality TV personality. Trump would first become a leading champion of the "birther" conspiracy, which played on suspicions about Obama to suggest incorrectly that he was not born in the United States. Eventually, Trump would slam Muslims, Latinos and immigrants as he made his way to the Oval Office. Quinnell is 85 now and still in Minnesota. On a Sunday morning she picked up the phone at her house. Asked what had made her want to attend the rally 10 years ago, she said, "I like Palin." She then announced that it was too early in the morning to talk. She was tired. She hung up.